They call Santa Barbara, California, the American Riviera, and this posh enclave located just 90 miles north of Los Angeles lives up to every expectation. Hugged by beaches and mountains, this town is alive with inspired architecture and a throbbing food and libations scene, and it’s replete with relaxed elegance. It’s no coincidence that celebrities, moguls and the well-traveled choose to live here, along with a mixed community that screams diversity and color. I, an L.A. transplant, have proudly called this community home for more than 15 years and can say, without hesitation, that traveling to this very special east-west slice of California coastline will never disappoint. These special Santa Barbara experiences are among my favorites. Skip the Grocery Store, Visit the Market The Santa Barbara Public Market is this city’s newest attraction. Wonderfully modeled after the great open markets in cities like Seattle, Vancouver and New York, the 15 purveyors at this spot inspire culinary strolling, with stops like Santa Monica Seafood for fresh fish, Belcampo Meat Co. for deluxe cuts, Culture Counter for cheese, Crazy Good Bread Co. for handmade loaves, JuiceWell for fresh-pressed juices, The Pasta Shoppe for an array of daily-made noodles and Rori’s Artisanal Creamery for tasty scoops. Wash it all down at the Wine & Beer bar, with some of the best wine-by-the-glass prices in town. Skip the Museum, Tour El Presidio The many museums here are top notch; I’m partial to the Santa Barbara Museum of Natural History, boasting a spectacular creekside setting. But for a genuine historical throwback, take the family to El Presidio de Santa Barbara State Historic Park. Located in the heart of downtown, these adobe buildings once were military outposts, established by the Spanish in the late 1700s. There’s a nominal fee to do the self-guided walking tour, which gives a genuine look at the grounds, sleeping quarters and artillery, and includes a visit to what is the second-oldest building in all of California. Go to Court, Catch the View Looking for the best perch in town? 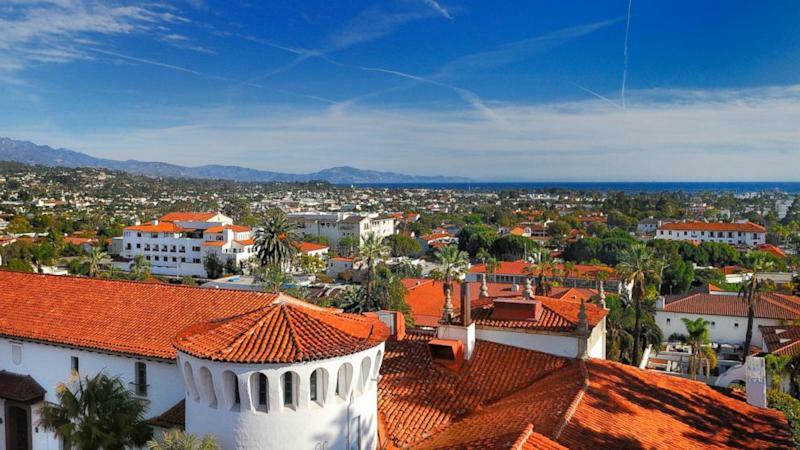 The Santa Barbara Courthouse – a gorgeous, historic architectural marvel in the heart of town – offers 360-degree views of this lovely red tile-roofed city, including the mountains that hug it and the shores that kiss it. Just take the elevator to the top floor Observation Tower and walk up the final flight of steps. The Courthouse, with a stunning Mural Room on the second floor and sprawling gardens on the ground level, offers free tours most days, too. Other awesome vantage points include the rooftop of the nearby Canary Hotel (if you’re not a guest, attend the Monday evening wine tastings every June through October, held on the roof) and the 4th floor patio at the Santa Barbara Maritime Museum by the water. Skip the Bar, Get Funky Downtown Santa Barbara, especially lower State Street, is well-known for its bar action. But for more educated sipping, the Funk Zone’s the place to be. This quirky neighborhood just off the beach and walking distance from downtown has seen amazing growth in a few short years. More than 23 tasting rooms make up the Urban Wine Trail today (there were five in 2007). And many double as working wineries – complete with towering stacks of French oak barrels – making them ideal one-stop shopping for the wine curious. Pinot noir fans should visit Whitcraft, Carr and Riverbench. Blends reign supreme at Municipal Winemakers, Oreana and Area 5.1. Rhone reds are king at Blair Fox and Jaffurs. And AVA Santa Barbara tastes you through this region’s five grape-growing areas. Visit Les Marchands wine bar – run by Santa Barbara’s only resident Master Sommelier – for old world wine finds. Still thirsty? Sip hand-crafted bourbon at Cutler’s Artisan Spirits or enjoy a cold one at Figueroa Mountain or Telegraph. And when it’s time to eat, hit The Lark (make a reservation) or the delectably stocked Metropulos Fine Foods. There are awesome art finds here, too. After the Funk Zone, Visit the Vineyard Use the Funk Zone as inspiration to visit Santa Barbara wine country, which is just 45 minutes north. The vineyards that paint the landscape here offer the quintessential wine country experience, with a welcoming vibe and accessibility that, quite simply, bests the more famous vines 300 miles north, and without skimping on quality. Go to Larner Vineyard and Rusack Winery in Ballard Canyon, Clos Pepe Vineyards (by appointment) and Babcock Winery in the Sta. Rita Hills, Fess Parker Winery along Foxen Canyon Road and Presqu’ile (with an awesome new visitor center) and Cambria in the Santa Maria Valley. Boutique towns like Los Olivos, Solvang, Ballard, Buellton and Lompoc are teeming with tasting rooms and great food finds. For comprehensive info, check with Santa Barbara Vintners (www.sbcountywines.com). After the Zoo, Visit the Rookery The Santa Barbara Zoo, complete with ocean view, is one of the most quaint and intimate zoo experiences in the country. And so is a small seal sanctuary located about 12 miles south, in the city of Carpinteria. This totally free experience peaks every December through May, during pupping season, when you can spot hundreds of seals and their offspring sunbathing on the rocky shore from a clifftop perch above. This is one of only four remaining sea rookeries in Southern California. Other free wildlife viewing spots include Carpinteria’s nearby Salt Marsh preserve (for egrets, bunnies and flying fish) and, in Santa Barbara itself, the Alice Keck Park Memorial Gardens downtown (with resident turtles and ducks) and Andree Clark Bird Refuge next to the Zoo. Skip the Beach in Santa Barbara, Try Montecito Celeb-spotting is a favorite pastime in Montecito, downtown Santa Barbara’s ritzy neighbor that’s home to stars like Oprah Winfrey, Rob Lowe and Dennis Miller. But for my friend John Palminteri, a news reporter with Santa Barbara’s ABC affiliate TV station since 1988, Montecito’s shores are the real draw. “You can park your car and leave it while you stroll scenic Butterfly Beach on Channel Drive, with views of both Montecito and the Santa Barbara coastline in one spot,” he says. “Paddleboarders share the waves with dolphins and the atmosphere is both local and international on the same stretch of sand. From there, you can walk a few blocks to Coast Village Road for quaint shops, cafes and restaurants and easily stroll back to your car after your excursion.” Trust him; Palminteri is well known as the Unofficial Mayor of Santa Barbara. Skip the Wharf, Head to the Waterfront Historic Stearns Wharf is a big tourist draw; the hands-on Ty Warner Sea Center is a great family visit. But for an even more colorful peek at Santa Barbara’s shorefront, walk a bit further west to the Waterfront, home to a boat-laden marina and several great seafood spots, including Brophy Bros. and the Endless Summer Café. You can rent kayaks here and, on Saturday mornings, shop for local catch-of-the-day right from the decks of the incoming fishing boats. The Lil’ Toot is a cute yellow boat that does the quick Stearns Wharf-to-Waterfront trip by water every half hour; but at $4 each way, I prefer the beautiful stroll along the beach or Cabrillo Blvd. Skip the 101, Drive the 192 Some locals won’t like me spilling this secret. But truth is, traffic on Highway 101 – the main artery in and out of Santa Barbara – sees its share of backups, especially in the morning and late afternoon. I prefer to hop on Highway 192, which skirts the foothills and takes you past gorgeous mansions, flower fields, tucked-away canyons and the occasional horseback rider. There are a few turns that offer awesome ocean views. But this is a two-lane road, so drive it carefully. You can pick up the 192 as far south as Carpinteria, and it ends at Highway 154, the threshold to wine country. Gabe Saglie is Senior Editor for Travelzoo, which features a bevy of Santa Barbara travel specials, as well as local deals at www.travelzoo.com/local-deals/California-Central-Coast/deals.